Summer tends to be scorching hot in Budapest. Especially in the city centre where the building walls, roads and pavements preserve the heat and do not cool down during the night as much as green areas do. outdoor pools and baths in Budapest (called strand in Hungarian). Note: Opening hours and prices are updated for 2018. The city card comes in 5 durations (24h, 48h, 72h, 96h and 120h) + a 72 -hour card for children between the ages 6 -18 years. Buy the Card Online with Free Delivery to Your Hotel/Apt. Nearly all children pools got new slides, and parks and facilities have been renewed at most places. Summer night parties in the Széchenyi bath on Saturday nights with different style of music each time: funky, soul, R & B, house, dance floor jazz. Most outdoor baths open around the end of May/beginning of June and stay open till mid-September if the weather is nice. 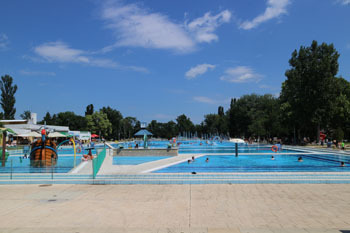 TIP: The Palatinus Strand on Margaret Island was voted among the most beautiful outdoor pools in the world by Guardian readers in July 2013. 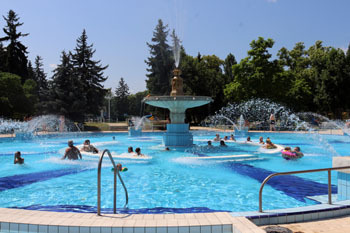 It’s the largest lido ideal for families with kids in varying age groups. Some beaches open on 1st May, the others open their gates during May depending on the weather. Beaches stay open throughout the summer until end of August or mid-September. 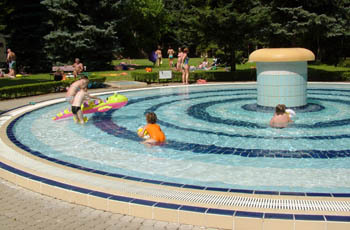 every day 08.00 – 20.00, outdoor pools operate from 28. April 2018.
weekends & holidays: 2 300 HUF. Budapest Card holders get a 20 % discount on entry tickets. 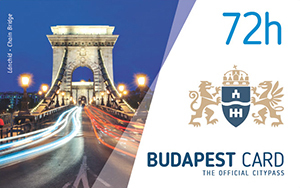 TIP: Buy your Budapest card in advance (with free delivery to your hotel/apt.). The Card entitles you to discount admission to a wide range of sights, and attractions in Budapest, and you can use it to travel free on the public transport system. Each card includes free entry to the Lukács Bath, to 8 museums in Budapest, and 2 free walking tours.. Relax and bath within a beautiful, green surrounding on the Palatinus Bath on Margaret Island, Budapest’s most scenic and popular recreation spot. Address: Állatkerti Körút 11., City Park, district XIV. All-day ticket with cabin use: on workdays: 5 700 HUF, on weekends-holidays: 5 900 HUF. All-day ticket with locker use: on workdays: 5 200 HUF, on weekends-holidays: 5 400 HUF. 20 % discount for Budapest card holders. 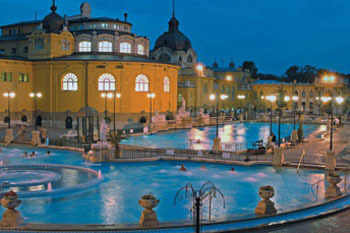 The Széchenyi Spa complex has altogether 21 pools. 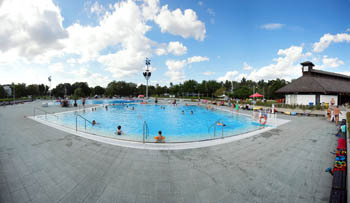 The large outdoor section, with 2 pools and a 50 m swimming pool, is open all year. It also has several thermal pools fed by a 76 °C natural spring water that comes from 1246 m depth. Besides the healing benefits of the water, you can enjoy a range of treatments and wellness services. 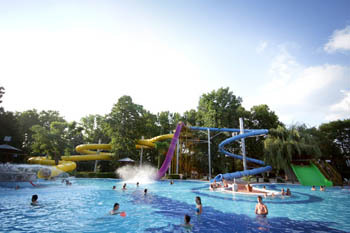 TIP: After a refreshing bath go for a walk in the City Park where several attractions (the Budapest Zoo, the Holnemvolt Park (the former Amusement Park) provide for entertainment for all members of the family. free for kids under 2 years of age, the thermal pools are not recommended for children under 14. 20 % discount with BP. Card. 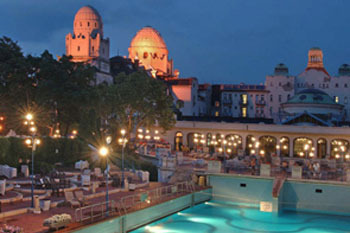 The grand Gellért Bath also has 3 outdoor pools including one for children and one with wave function in summer season. Address: Íves utca 16., Budapest 1044., district IV. All tickets include locker use. Family tickets are available in various options between 10 690 – 15 690 HUF. 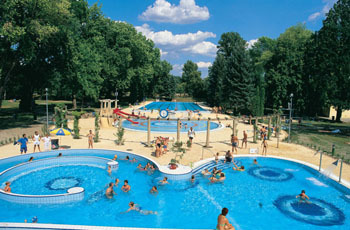 The Aquaworld is one of Central Europe’s biggest water park and resort with an onsite 4-star hotel. Address: Rozgonyi Piroska 2., district III. The Romans had already gained their water supply from the area in the 2nd and 3rd centuries, but they surely didn’t enjoy the neck shower, an effervescent facility and other amenities that you can today at the Római Beach. The 2000-year old ruins of their settlement named Aquincum can be seen in the nearby Aquincum Museum. 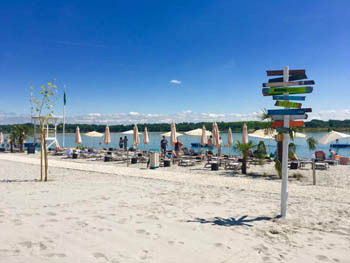 Although a bit far from the city center, the Lupa lake with two exquisite sandy beaches well worths a visit. It is Hungary’s biggest lido where the crystal clear lakewater is excellent for swimming or stand-up paddling. Getting There: bus 42, suburban railway to Szentendre from Batthyány tér. 26. May – Beginning of September: every day: 06.00 – 20.00, cashier closes 1 hour before colsing times. 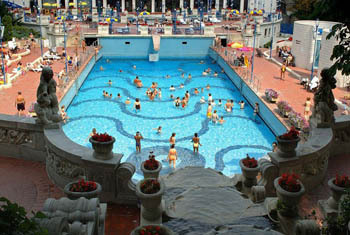 Csillaghegy Bath and Swimming Pool has been operating since the second half of the 19th century. The pools have been built into the side of the hill in a terraced form. on the upper level the children’s pool welcome the young water lovers while their parents can get a nice tan on the sun terrace. 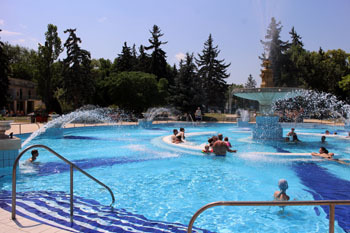 Pools are filled with natural mineral water with high calcium-magnesium-hydrogen-carbonate content. TIP: If you soaked enough in the water explore the peaceful neighbourhood that has some interesting sights, like the refurbished Tomb of Gül Baba in northern Buda which is an important Muslim pilgrimage site today. Address: Egressy út 178/f, district XIV. Free for children under 3 years of age. 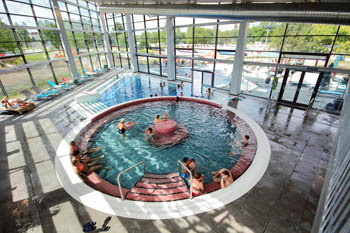 Hot spring water containing calcium-, magnesium-hydrogen-carbonate and chloride, also sodium ions feeds the bath units of Paskál. Though it’s a bit out of the city centre, the large park around the Paskál bath is worth the trouble of getting there. There is also sauna park that has a unique geothermal sauna. 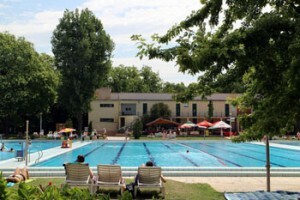 The beach is at the Danube bank in Buda within a beautiful, landscaped environment where 3 pools welcome both young and old. Children and Senior Citizens: 1 500 HUF, free for children under 3 years of age. 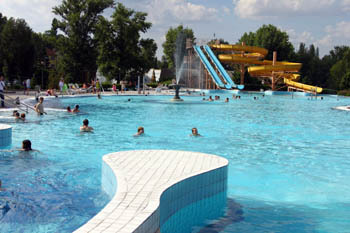 This is a quite large beach right on the banks of the Small Danube, with one thermal pool, kids’ pool, a leisure pool and a swimming pool. See also our Budapest baths page. very nice and beautiful beaches for children and senior citz.